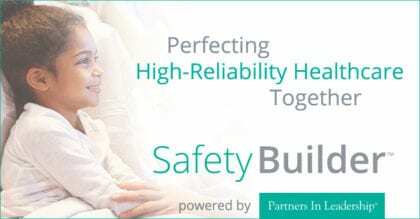 Partners In Leadership, LLC, , introduces Safety Builder—Perfecting High-Reliability Healthcare Together, a revolutionary safety-focused program designed for healthcare professionals. Temecula, Calif., August 23, 2018 – Partners In Leadership, LLC, the firm that guides clients in defining Key Results™, shaping Cultural Beliefs®, and solving Accountability Gaps, introduces Safety Builder—Perfecting High-Reliability Healthcare Together, a revolutionary safety-focused program designed for healthcare professionals. Safety Builder provides a unique application of Partners In Leadership’s award-winning curriculum to improve safety outcomes and patient experiences. The training is designed to help healthcare professionals think differently about safety where past strategies to improve safety and patient experience have had little impact. Implementation of the core models changes mindsets, resulting in increased safety throughout the healthcare organization. “We’re offering healthcare organizations an alternative approach to patient safety that gets to the root of hospital safety: the beliefs held throughout the organization and the experiences that cause those beliefs to take shape,” said Corbridge. “Safety Builder gives healthcare professionals a simple approach to align safety and culture to improve patient safety results. The training teaches hospital leaders and staff to immerse the language of safety into everything they do and create an environment for talking about safety and identifying and addressing safety concerns. They learn why safety needs to be prioritized in the minds of leaders, physicians, and staff to the level of importance as quality, access, and affordability. The actionable plan leads to actionable results. The firm has engaged a team of highly experienced healthcare and management facilitators to train, coach, and engage healthcare professionals to build a Culture of Safety. Safety Builder’s unique approach to quality healthcare and safety training through culture is part of Partners In Leadership’s commitment to deliver world-class consulting and training solutions. Partners In Leadership guides clients in defining Key Results™, shaping Cultural Beliefs®, and solving Accountability Gaps. With our network of experts around the world and #1 award-winning content, our firm helps clients achieve their mission by dramatically boosting employee engagement, inspiring innovation, improving cross-collaboration, developing accountable leaders, blending strategy with culture, and more. Partners In Leadership continues the legacy of pioneering Accountability Training, and innovating cultural transformation. For further information on Partners In Leadership, visit www.partnersinleadership.com or call 800-504-6070. For press inquiries, contact Anique Mautner at anique.mautner@partnersinleadership.com or (951) 376-3169.